“Martial law” was just a buzzword when I was growing up, hemmed in within the walls of an all-girl Benedictine school compound, something we talked about in passing during our history class. While the lesson itself was short, I remember feeling a sense of indignation towards the former dictator Ferdinand Marcos and his family who imposed martial law on the nation from 1972 to 1981. At that age, my comprehension was limited to what my mind could fathom: the ridiculousness of it all, the audacity of the Marcos family, and how I would be paying for a debt when I haven’t even started earning yet. That was about 20 years ago. In May of this year, President Duterte declared martial law in the southern part of the Philippines after alleged ISIS-backed groups clashed with the country’s armed forces. To date, more than 84,000 have been displaced after being forced and ordered to evacuate from their homes. Last year, I published a post about martial law revisionism after seeing the resurgence of the Marcos family in the Philippine political area, backed by Duterte nonetheless. Call it historical amnesia if you will, call it historical apathy. It wasn’t until I moved to the United States, until I moved away did I start to see my home country in a different light. Loving her from a distance. And it wasn’t until I became part of a national democratic movement did I learn about the atrocities of martial law, beyond what I learned in the classroom. There were the economic ramifications, but also the grave human rights abuses. The suspension of writ habeas corpus. The torture. The enforced disappearances. Fear. The erosion of trust within communities, within movements. I saw all of these when I read Lualhati Bautista’s book Desaparesidos (Amazon), a novel about a family’s struggle during Marcos’s martial law. Anna is a mother, a widow, a survivor of torture and a former member of the New People’s Army, the armed wing of the Communist Party of the Philippines that the administration was trying to crush. The book revolves around her struggle and her story, from the time that she was part of the NPA, to her abduction where she was tortured and raped, to the time when she was imprisoned, and up until she went back to her civilian life as an NGO worker. The story starts with a convening of NGOs, faith-based leaders, international human rights organizations, lawyers and martial law victims and survivors as a case against the Marcoses is being prepared. Anna is present, but her mind wanders back to the time when she saw the body of her lifeless husband in the town plaza, afraid to claim it for fear that their newborn child in her bosom would suffer if she did. She would be immediately identified as a rebel, her cover blown. Hinigpitan niya ang yakap sa anak. Anak, tatay mo. Ayun siya, iyong nasa pangalawa. Namatay siya para sa bayan. Gustong-gusto na niyang yakapin ang bangkay ni Nonong. Gustong-gusto na niyang bugawin man lang ang mga langaw na nagpipista sa natuyo nang dugo sa mukha nito, halikan ang mga daliri na binunutan ng kuko. Pero wala siyang magagawa. Kailangan niyang magpakabato, timpiin ang sarili, mag-isip ng masaya. She held on tight to her child. My child, here’s your father. There he is, on the second. He died for the nation. She wanted so badly to embrace Nonong’s corpse. She wanted so badly to swat away the flies hovering over the dried blood on his face, kiss the fingers where his nails were torn out. But she couldn’t do anything. She had to be steely, compose herself, think about happy thoughts. While Anna was helping build a case against the Marcoses, the story pivots between several events and characters to reveal the kind of repression Filipinos were dealing with at that time. There were mass arrests, harassment from soldiers, even the burning of homes in villages. Bautista painted fear in every character: from the former rebel who pointed out his comrades’ hideouts, the pregnant lady who was entrusted to take care of Anna’s newborn, Anna’s second child Lorena (named after the revolutionary martyr Lorena Barros) who resented her parents for being away, and the family of Mang Manuel and many others. To you — my dear readers — an apology is in order: the blog has been quiet as of late, but I haven’t forgotten. It’s been a week since I last wrote (another #GetLit post nonetheless) and here I am, about to publish another one. I have a good excuse, I promise. The photo I took above is none other than Biblioteca Vasconcelos, Mexico City’s megalibrary. The floating bookshelves are no joke, and I marveled at the architectural prowess of Mexican architects Alberto Kalach and Juan Palomar. 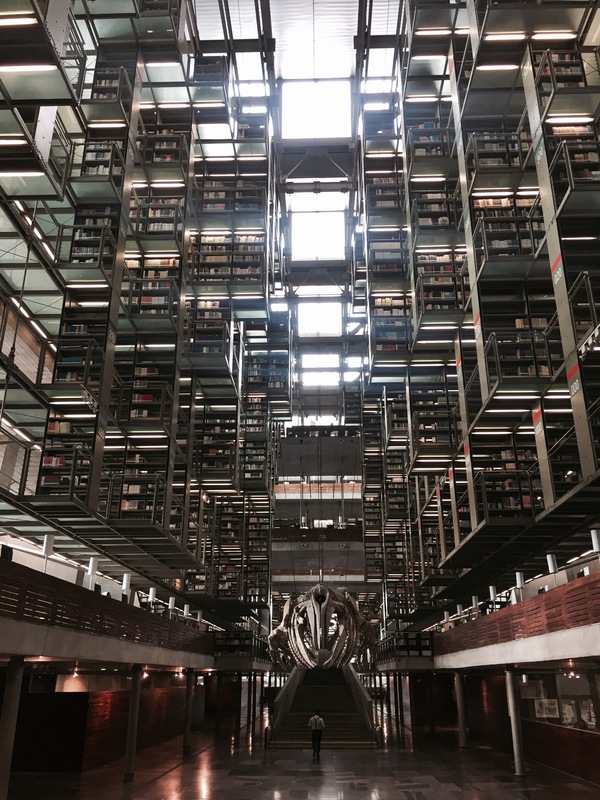 The five-on-one library is dedicated to José Vasconcelos, a Mexican philosopher and figure. I love me some Roxane Gay, but I also love me some Steph Curry and Kevin Durant and the Golden State Warriors. Trumpacolypse is still upon us. A few weeks ago, I wrote a post about saving the National Endowment for Arts (#SavetheNEA) to try to gather support for the arts. Specially for the work of women artists. Question: What does abolishing the NEA mean for women artists? Read on.